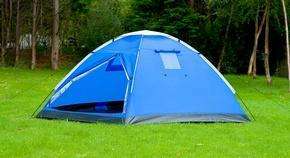 4 person tent is normally 24.99 upwards at most stores. Bargain! cheaper than a 2 bit hoare... wonder what the HH is? wouldn't risk camping in a cheap tent like this - check hydrostatic head for water- proofness. I bought the B&M '2 person' tent and was pretty awful. It was around 2/3 the size of an actual 2 person tent (at the most) and there's no chance two adults would fit in it comfortably. I ended up letting a friend have it who said "I think somebody pee'd in it", which I gather was all the condensation? It was also pretty see-through. Reason I'm describing the 2 man is because it's the smaller version of this! I bought the B&M '2 person' tent and was pretty awful. It was around 2/3 … I bought the B&M '2 person' tent and was pretty awful. It was around 2/3 the size of an actual 2 person tent (at the most) and there's no chance two adults would fit in it comfortably. I ended up letting a friend have it who said "I think somebody pee'd in it", which I gather was all the condensation? It was also pretty see-through.Reason I'm describing the 2 man is because it's the smaller version of this! There will be loads of condensation because its a single skin. Dont waste your money folks. Don't waste your money folks. Vango tents all the way! Have you seen their new range? It hasnt got any poles and takes just a few mins to put up. And that was a 6 man tent when I saw a live demostration! Vango Airbeam Watch the video! I really want one!!! A good mac for fattys. Wow I want one too! Deal posting newbie! This is liambxox first deal post. Help out by leaving a posting tip or just to show your appreciation for their contribution.